Black Wool Suit with Velvet Illusion Lapel by Dolce & Gabbana, Page Print T-Shirt by Christopher Kane, and White Cotton Shirt by Dior Homme. Black blazer with four-button line, White Slim fit cotton shirt, and Black Slim fit classic pants by Raf Simons, Crystal lapel pin by Louis Vuitton, and Stainless steel and metalized sapphire watch by Movado. 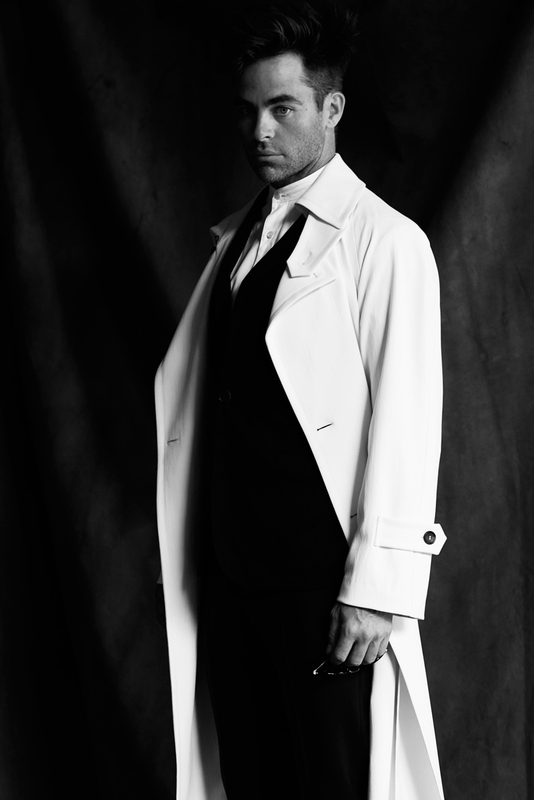 Belted tuxedo trenchcoat in matte suiting by Marc Jacobs, Black and white cashmere sweater by Prada, White cotton shirt by Calvin Klein, Wool pants by Ermenegildo Zegna Couture, and Swift calfskin belt by Hermès. White Polyester trenchcoat by Giorgio Armani, Black Cotton one-button jacket with composed ribbons by Hermès, Double sleeve cotton shirt with mandarin collar by Public School, Black wool and silk pants by Emporio Armani, and Polarized folding acetate sunglasses by Persol. Cashmere blend coat and silk navy blue blazer by Valentino, White cotton spread collar dress shirt by Brioni, Black wool and silk pants by Emporio Armani, Black patent leather smoker flat shoes by Christian Louboutin, and Santos 100 large model steel watch by Cartier. Silk navy blue blazer by Valentino, White cotton spread collar dress shirt by Brioni, and Black wool and silk pants by Emporio Armani. Huracán LP 610-4 2015 with 602-hp and 5.2-liter v-10 by Lamborghini. Things are about to get a little off-course with Chris Pine. There’s still about a half-hour’s worth of sunshine in Silver Lake and a few after-work joggers are parading by the large windows of the restaurant where Pine and I have agreed to meet for dinner. He strolls in, Hollywood casual and a few minutes late, chipping a silver-screen smile at Kelsey, the bartender, as he crosses the room to shake my hand. This, along with his dashing enthusiasm for the wine list —“It’s always so exciting”— is the sort of thing that’s more or less expected, but as anyone who’s ever gotten mysteriously lost trying to find the 5 Freeway will tell you, L.A. can have a way of toying with one’s sense of direction. These subjects—self-transformation, self-realization—are where the conversation is finding focus. And Pine’s interest explains, perhaps, a conversational tic. He’s a relentless self-editor, taking care before answering any question and often restarting twice or thrice before continuing a sentence. There is no unexpurgated Pine. This trait could be ascribed to obvious intelligence, and that’s part of it. But there’s an impression that some considerable control is being exercised, a filtering of evolving options, and I feel I’m watching Pine write his responses on the fly. This is reinforced by the fact that he’s attentive to the specific words he chooses, as well as being a careful listener, at least twice recalling conversational details once-mentioned by me two glasses of wine earlier. Composure’s the right word, especially in the sense that the moment itself is being composed. We’re seated in a corner of a white tablecloth dining room framed in lots of dark wood, attended by a genial staff familiar with Pine’s patronage and who keep a ready, but distant, orbit. As the night proceeds, wine flows and takes hold, and the noise picks up, but gradual, steady increases of intensity lend a sense that the evening is somehow choreographed, the setting conceived. I have the unexpectedly pleasurable feeling of being a character who’s found a story. I’m hoping for some good dialogue. It’s a nice point, and charming given how he’s extended the metaphor. And so we get into it for a few minutes. I tell him about losing my father and he, as usual, pays close attention, but he eventually lands on a statement about success. 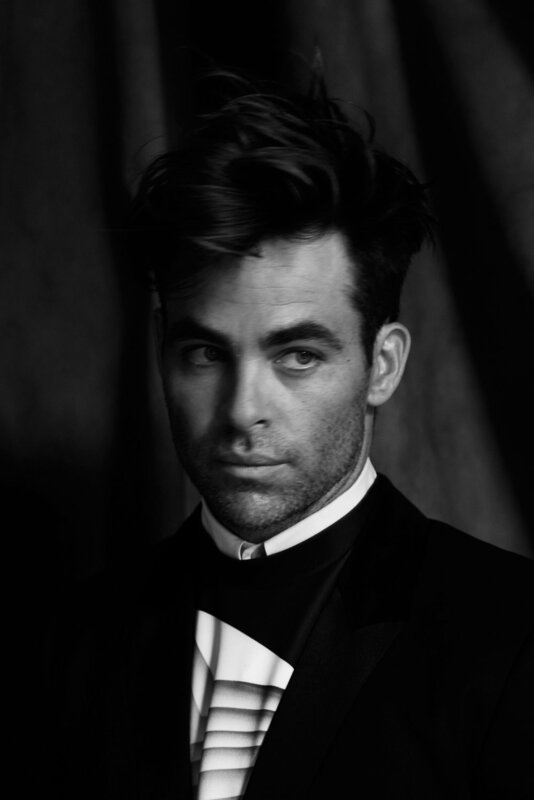 Pine also has a busy career, for which he’s taking an array of roles that vary from his turn as the intrepid captain of the Enterprise. Horrible Bosses 2, for example, which opened late November, is a fun continuation of the first film’s madcap situational antics and clown-chums chemistry. My initial impulse when seeing the film was to resist it, to play skeptic at the magic show. But I found myself chuckling along in short order, enjoying the wack-vortex conjured by Jason Sudeikis, Jason Bateman, and Charlie Day. Pine, aggressively complicating the worst-laid plans of the film’s leads, seamlessly accents the ensemble and is a natural in the genre. There’s a scene in which Day’s character, Dale, defending his point-of-view towards a vulnerable Rex, played by Pine, asserts “He’s just really, really, really, really, really likeable.” Part of the hyperbolic joke, of course, is that it’s a wink at the audience and Dale, after all, is only half-joking. Of the film, Pine says, “It’s ridiculous. I think it’s really funny. We finish a bottle of wine and Pine stays far longer than the appointed time, chatting over this and that before giving in to the demands of texting friends. We shake hands and he glides out of the restaurant and into a black SUV ready to take him to whatever the evening has in store. I settle up, walk out to the sidewalk, check my email, make for my car. It’s a warm night and Silver Lake always feels like a mix of what’s been and what’s to come. Montaigne got it right when he said, “I do not portray being: I portray passing.” This neighborhood, for me, keeps the past while feeling very now, an always-moving target. Photographer: Tetsu Kubota for bridgeartists.com. Stylist: Sean Knight for jedroot.com. Groomer: David Cox for celestineagency.com. Set Designer: Sonja Kroop at SonjaKroop.com. Prop Assistants: Caitlin G. Dennis and Amy Marie Slocum. Location: Mack Sennett Studios at macksennettstudios.net.